Social psychologist Ben Monroe has returned to Tokyo after a failed marriage, determined to seek out his former lover Kozue. His estranged teenage daughter Mazzy reluctantly flies from California to join him. On the flight she meets a young Japanese man, Koji, a cult survivor. As Ben delves deeper into the underworld in search of Kozue, Mazzy and Koji are compelled to follow, and their four lives dangerously intersect as past and present collide. Nicholas Hogg was born in Leicester. After graduating from university with a psychology degree he traveled widely, living in the USA, New Zealand, and Japan. When he first moved to Tokyo he worked as an English teacher and an actor. He then became press officer for a Japanese NGO ship and sailed around the world three times, reporting on global development issues. 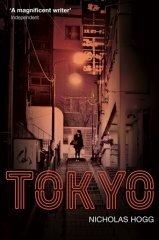 Tokyo is his third novel.